Backups are a constant problem for avid photographers. Even if you keep copies on external hard drives, you really need an off-site backup as well, incase there’s a fire or some other (far more likely) disaster like a disk failure. Personally, I keep numerous backups, one on a 4TB RAID external drive (spread across two disks, so if one fails, the other can be replaced without losing any data), and a full off-site backup using the inexpensive cloud service CrashPlan. It just ain’t pretty. Good luck trying to find anything useful in there quickly. No thumbnail previews… nothing. We live in the Netflix era, so this doesn’t really cut the mustard. In a conversation with my good friend Al on this topic, he floated the idea of using Flickr for backups. I wasn’t too keen on this idea at first, as I didn’t want to clutter up my main, curated Flickr account with lots of pictures I would never release publicly. However, the more we chatted, the more it seemed to make sense. With 1TB space provided for in a free account, I signed up for a second one to try it out. 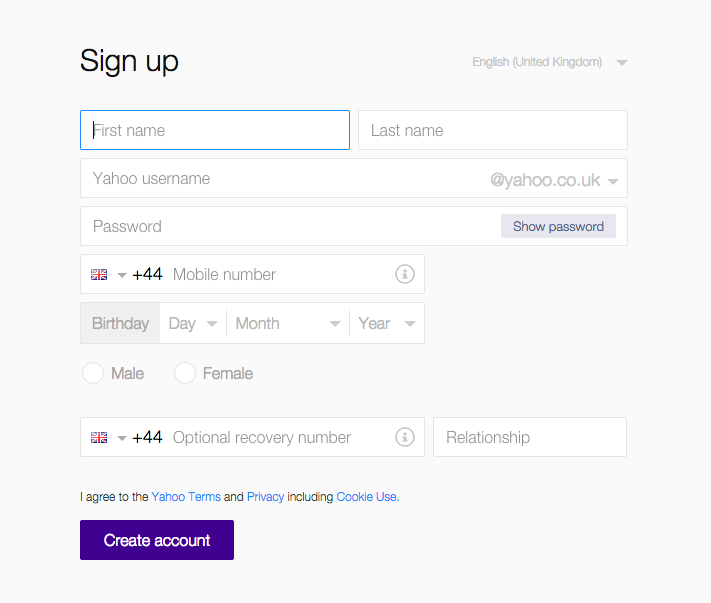 The first hurdle I ran into was the Flickr signup page. Skipping ahead to when you’ve got your account all set up, the easiest way to upload a large number of images is to use the Flickr Uploadr app. Right now it’s apparently just in beta, so not released generally, but you can find it if you Google about a bit. In essence, it acts like Dropbox. You select the folders you want, the uploadr watches them for changes, and uploads the files within into albums on your backup account. It’s pretty straightforward, and works surprisingly well. It looks out for duplicates, and doesn’t upload them (provided that they are the same dimensions/size). 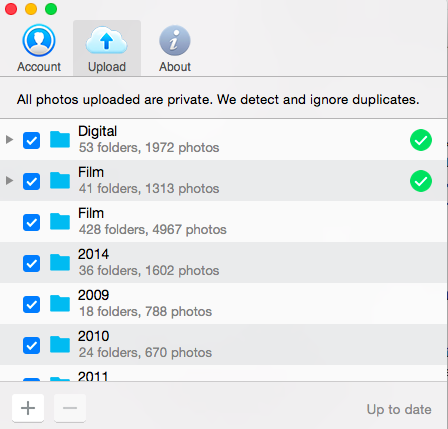 Even if you switch pictures between folders, it acts as you would expect – not uploading a duplicate. If you are watching folders kept on an external disk, once you disconnect and reconnect the drive, the app doesn’t realise this has happened, so won’t refresh the changes properly. To do this, you’ll need to remove the relevant folders and re-add them to trigger a synch. New albums are created based on the name of the folder that contain the images. In my case, this meant I had to be much more descriptive in the name of the folders. 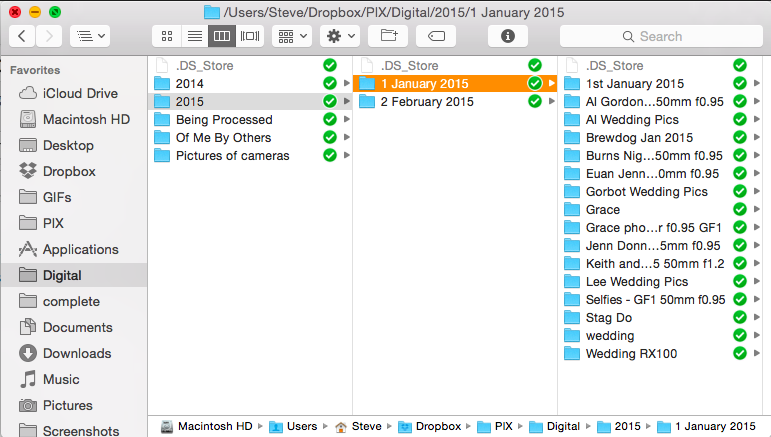 Rather than just having a subfolder under ‘2015’ > ‘3. March 2015’ as ‘Night out with Jimmy’, I had to rename it to ‘Night out with Jimmy – March 2015’ so that it was easier to identify the album once it was uploaded. Browsing through older pictures is way easier, and more of a pleasure than it ever used to be. The one problem is that tags don’t get added to pictures when uploaded, unless they are already present in the metadata. This is something I’ve never been good at keeping ontop of, so searching for specific pictures can be difficult. This is where the real cracks began to appear. Downloading more than a few proved to be a royal pain in the arse. 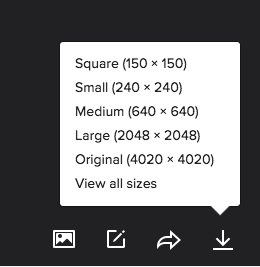 For whatever insane reason, Flickr provides no built in way to download pictures in bulk. There are some third party apps that claim to be able to do this, but most of them are terrible. Not good at all. Flickr Downloadr was one that I had started to use, as despite its crappy GUI and logo, it seemed to work okay. Lately though, it crashes whenever I login, so that’s gone out of the window. 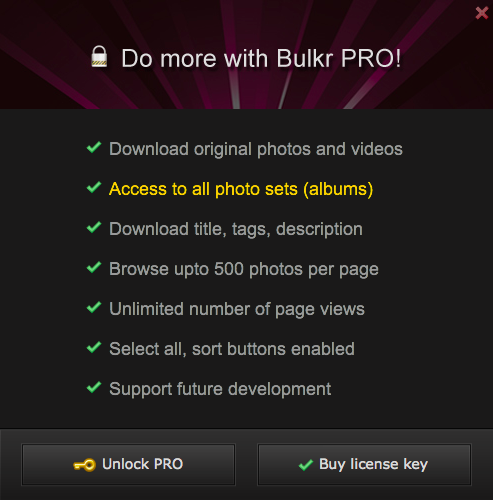 Bulkr looks pretty sweet, but if you want to download any decent amount of pictures, you need to pay for the Pro version, which starts at $29.99 per year. The one off cost is $60, currently down to $39. That’s ridiculously expensive for what it is, so there’s no way I was going to stump up the cash unless I was desperate. I’m pretty pleased with how things have gone using Flickr as an additional storage platform. I can quickly get access to whole sets of pictures and browse through them visually, no matter what computer I’m on – which is awesome. The initial act of getting everything organised and uploaded wasn’t as big a hassle as I thought either. 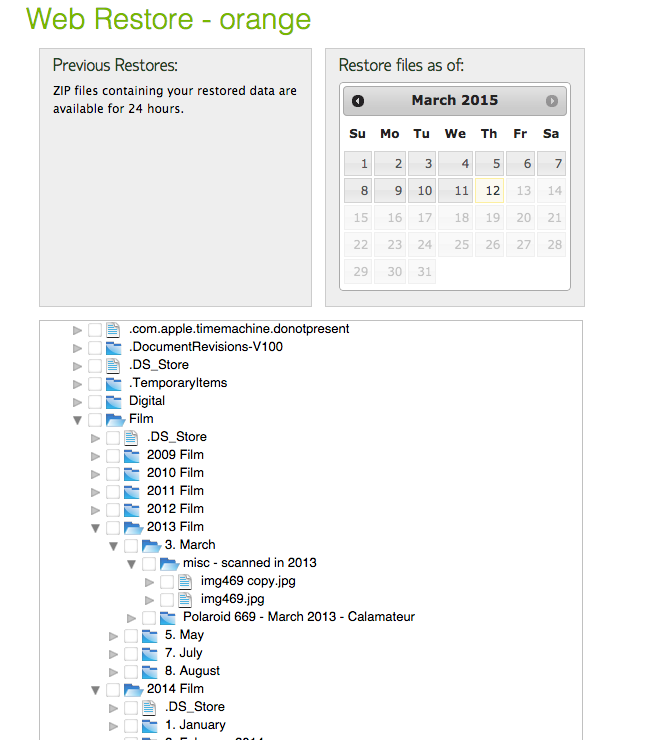 As a whole photo library backup tool though, it’s probably not ideal. If you want to stump up the pricey cost for Bulkr, it could work, but I wouldn’t want to rely on a third party app to download all of my pictures should something bad happen. What do you use for photo sharing and stuff Pam? I asked about this a while back, when my site was still self-hosted. I moved everything on Flickr to Smugmug for backup and non-blog sharing. I used to post pics on my blog posts from Flickr, but no more, since they got rid of posting to WP right from Flickr. Depending on how you name or tag your pictures there can be a bit of a social cost to this, too, in terms of being a pita to other people. Many many years ago, I went to college at (we’ll call it) Fred’s College. After I went there, but still years ago, somebody was apparently the official photographer for the Fred’s College football team. He (or she) went to every practice and every game, and shot, I guess, tens of thousands of pictures. All of them are tagged “Fred’s College.” All of them were uploaded to Flickr. So now, years later, he’s forgotten them. Left them behind. If I or anyone else who went there searches for “Fred’s College,” looking for pictures of friends, or just nostalgic photos of our old school, what we get is 3,500 of his football practice scratch pictures, and the message “Maximum number of matches retrieved” or something similar. There doesn’t appear to be any way past this. That is true. In my case, I had the whole thing set to private anyway as I didn’t want my entire photo collection being publicly available. As it stands, I’ve moved away from using Flickr like this… I have a new solution!